It's always exciting to go to my mailbox, and see the new packages coming in from different brands. I get extra excited when Sprezzabox comes in! I have the privilege of being one of Sprezzabox's Brand Ambassador; many of my fellow blogger bros are also BA's, and we share the love for Sprezzabox. So what's Sprezzabox? 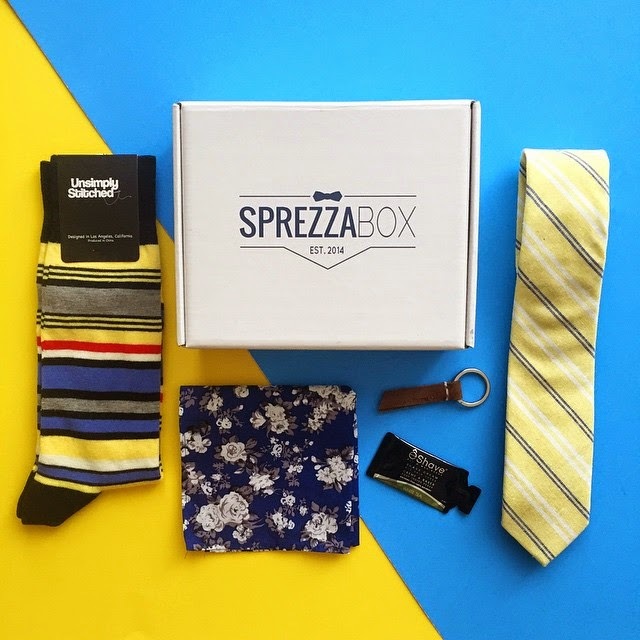 Sprezzabox is a company based in NYC that curates the latest in accessories such as ties, socks, and personal care items all for just $28 a month. Each month, you receive about 4 to 5 items that tend to go in pair with one another. The beauty of this concept is that you discover new brands along the way, and you discover new brands that might fit your interests and needs. Winners Circle Fashion Co. Pocket Square: Retailing at $12, this pocket square is perfect for just about any blazer, denim jacket, or leather jacket. The floral pattern printed on this linen fabric gives you the option of dressing this with a casual or formal outfit. Unsimply Stitched Socks: Retails for $12, the popular sock brand made it into this month's Sprezzabox. I happen to own a couple of pairs of the brand, and I can honestly say the quality is superb! Their patterns are unique compared to other brands. Once you try a pair of their socks, you'll for sure be hooked up on them! Stock & Barrel Co. Leather Key Chain: This keychain that retails for $10 is by far one of my favorite items found in this month's box. I love collecting leather items; messenger bags, bracelets, belts, you name it! The beauty of the leather keychain is that over time it will start to take a darker hue, and the more "worn out" it gets, the cooler it looks! This keychain is sure to add style to your car keys. eShave White Tea Shaving Cream (Sample Size): This is where I'll be honest..I don't have much facial hair, but I DO need shaving products to shave whatever I have going on. I tried the product last night and I'm impressed with how you acquire the perfect shave! I'm talking about total smoothness and a clean look! The full size (4 oz. bottle) retails for $24, which is a reasonable price compared to other expensive (and ineffective) shaving cream products. Interested in your OWN box? Say no more! click HERE and use promo code "CASUALBOARDWALK" at checkout to receive 15% of your purchase. This include monthly subscriptions and single purchases. Let me know your thought's on this month's box and check out more sick photos of this month's box through my Instagram @thecasualboardwalk.